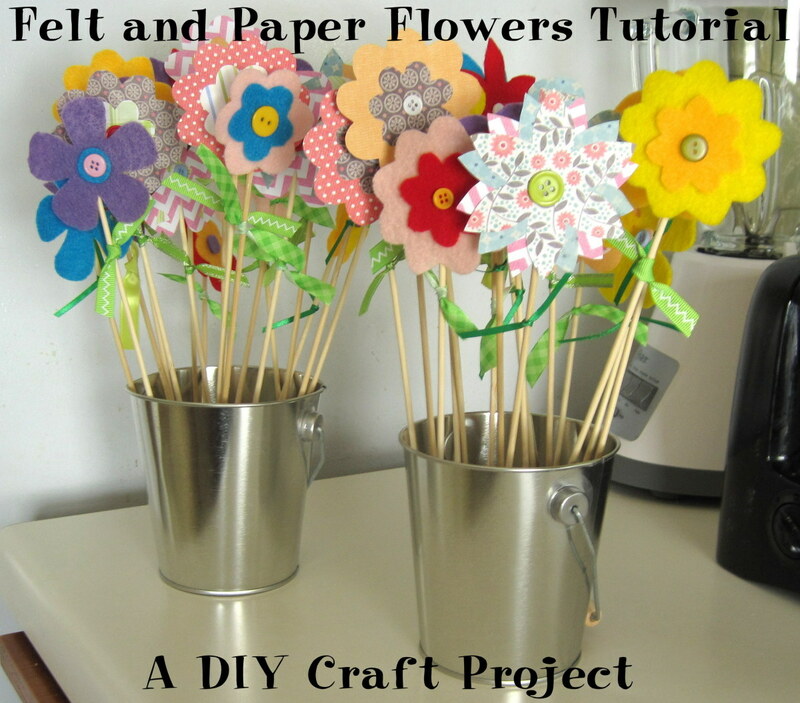 Tips, free patterns and tutorials for instructions on how to make your own felt flowers. Use them as pins, or on hats and bags, or make a felt flower scarf, wreath or bouquet. I think you'll get addicted to making these beautiful flowers, like me! 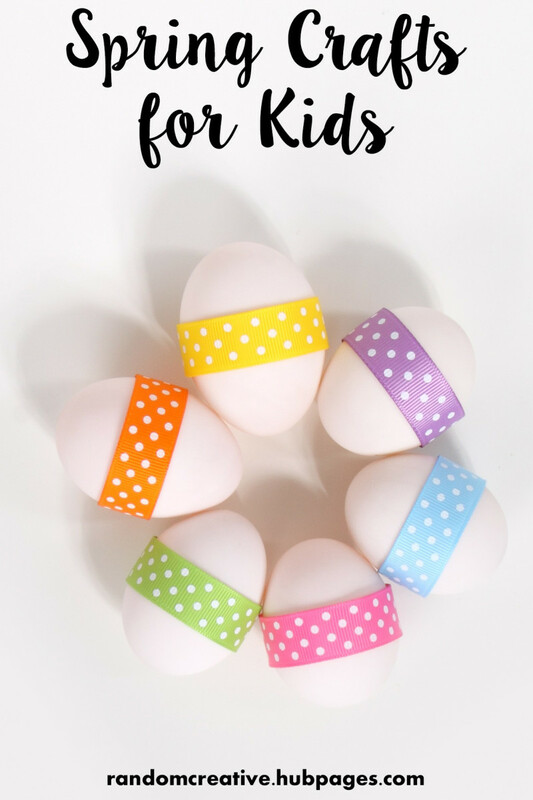 All the patterns are easy and quick to follow and only require a few basic supplies. Use acrylic felt, or wool felt for extra richness. Most of these tutorials can be made without sewing. 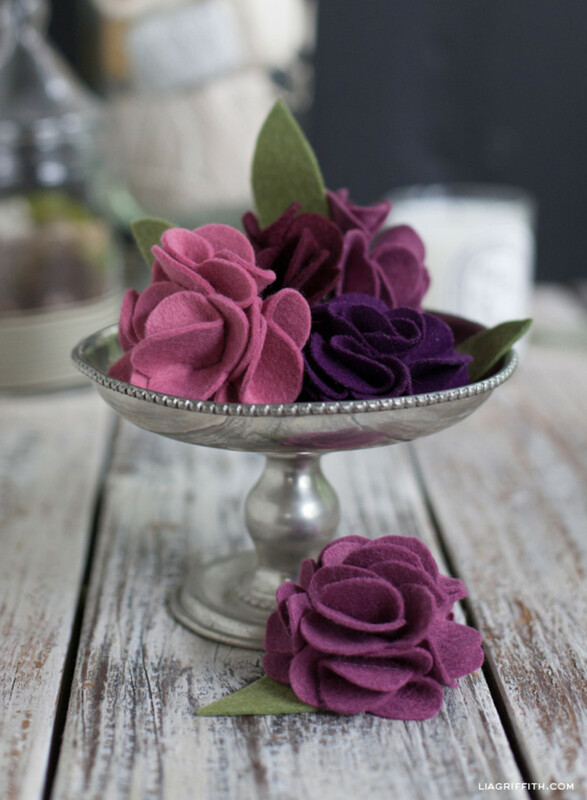 Enjoy learning to make these felt flowers! 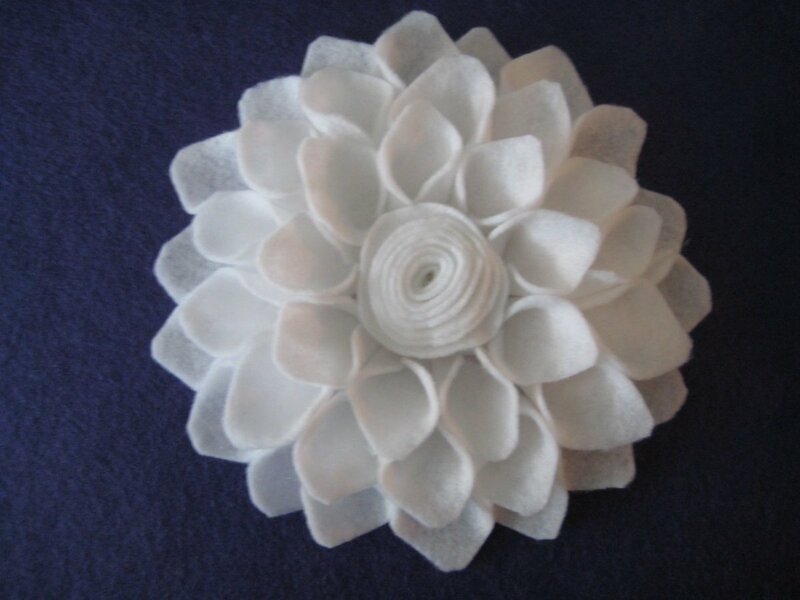 Felt flowers are usually made by one of four basic techniques - some use a combination of them.The effect of creating a particular flower (rose, mums, peony, daisy, etc) is achieved by shaping or cutting the top of the felt petals in different ways. Rolled - the flower is made by rolling and glueing or sewing a felt strip - cut in a spiral, a straight line or a straight piece which is folded and then rolled. Petal by Petal - these flowers are built up by attaching individual petals, either to each other or to a base. The petals can be simple circles or squares or all sorts of fancier shapes. Folded - Several felt circles with plain or fancy edges (some with deeply cut petals) are folded in half and quarter and then attached together at the bottom points to create a flower. 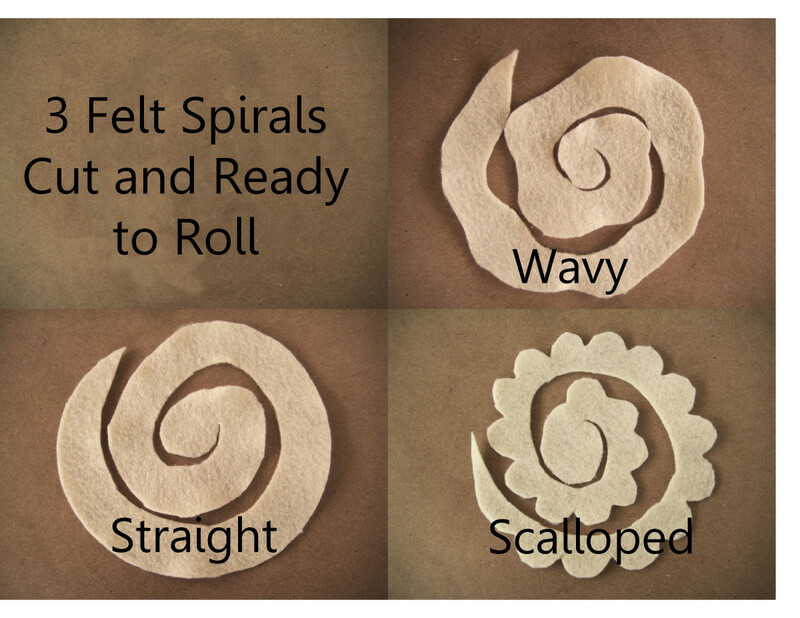 Flat - This technique involves cutting felt flower shapes in several sizes and then stacking them in order largest on the bottom, smallest on the top. They are sewn or glued together usually through the center. 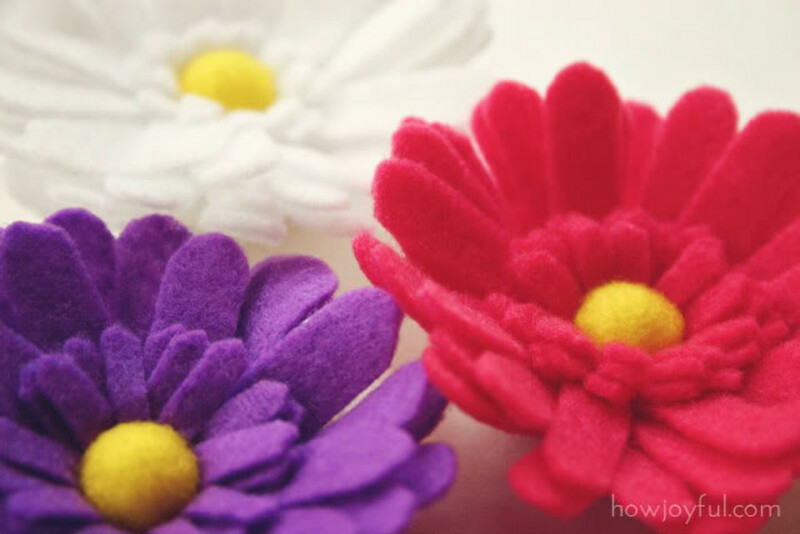 I find this the all-time easiest way to make felt flowers. It is a simple technique with many possible variations - for bigger flowers use a longer strip, smaller flowers - smaller strip. Strips can be straight or cut in a spiral out of a circle or even a square. The final look can be changed by the shaping of the top edge of the strip. 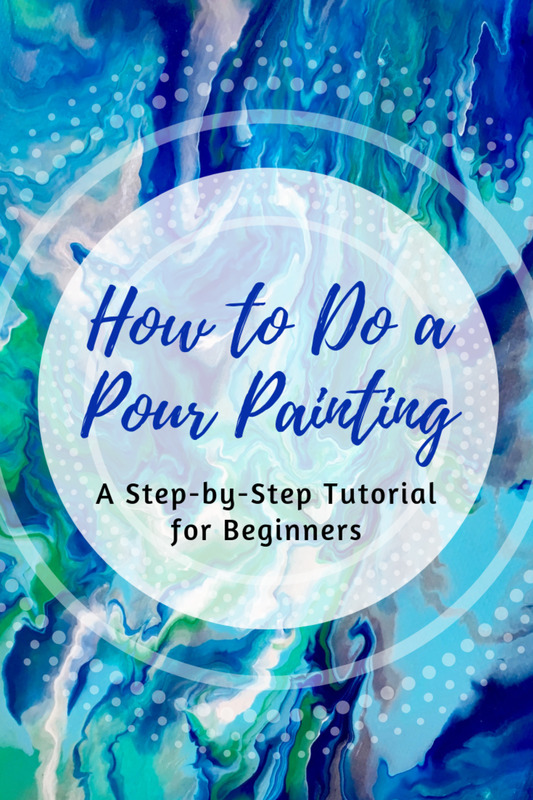 Each tutorial has simple, clear and easy-to-follow instructions. 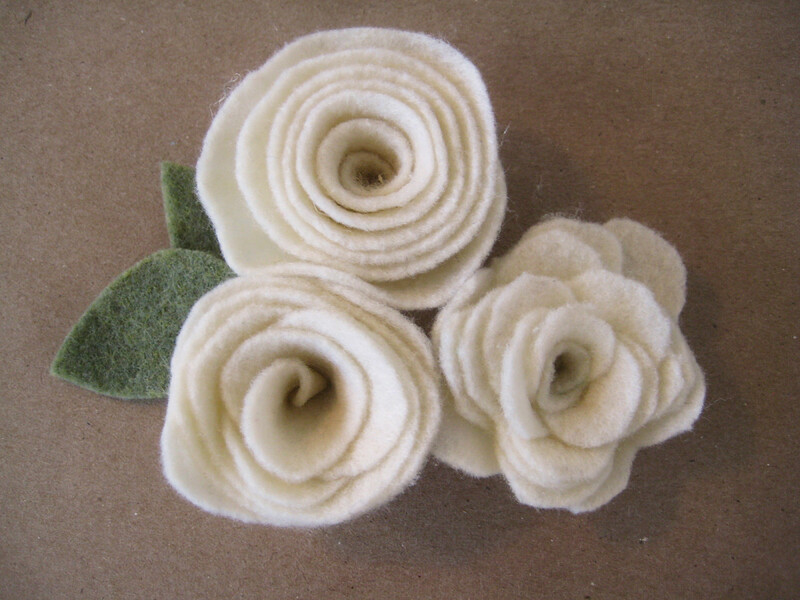 Rolled felt roses get their own section, then other rolled felt flowers follow. Gorgeous large felt rolled roses by the very talented mom, Anissa at Two Little Bugs Clothing Co. She also includes the entire tutorial for making a pillow with the rose and instructions for the wreath. Image at right. 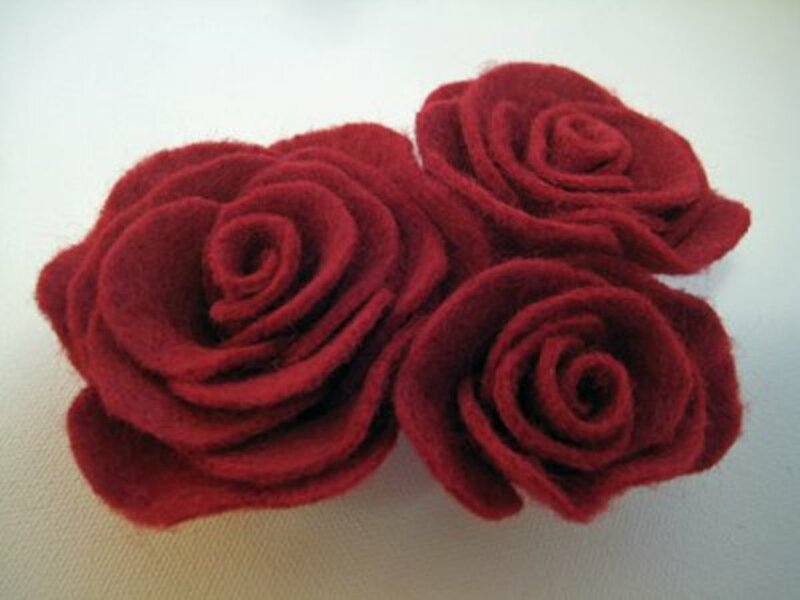 These are the really easy and adorable felt rosettes, made by rolling the felt. This is no-sew (you could sew if you wanted to, but it's not necessary). 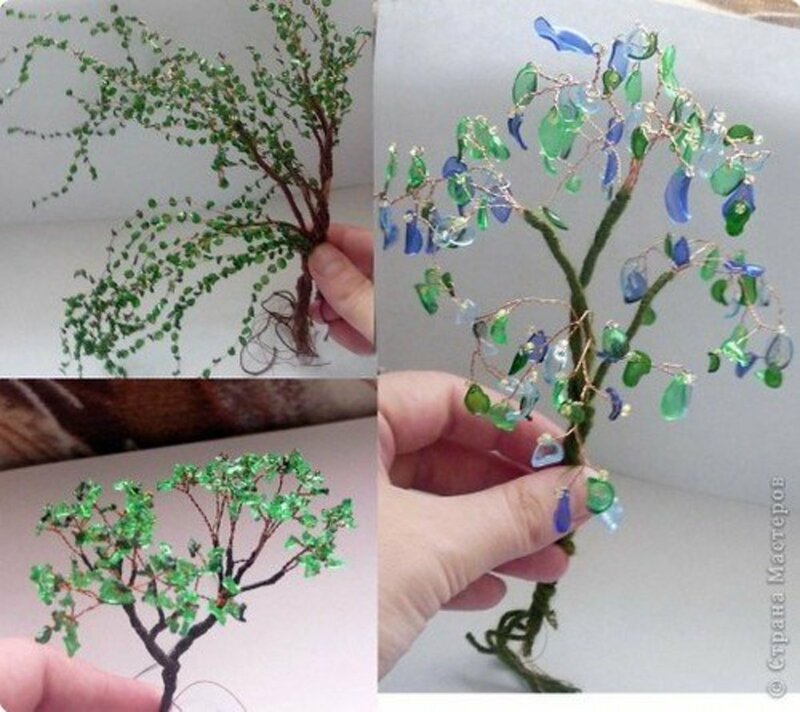 These look gorgeous as gift embellishments, on pins, wreaths, bags, lampshades, etc. Photo right. Learn how to make this pretty and simple Valentine Wreath which includes a velvet rose and rolled felt flower tutorial. 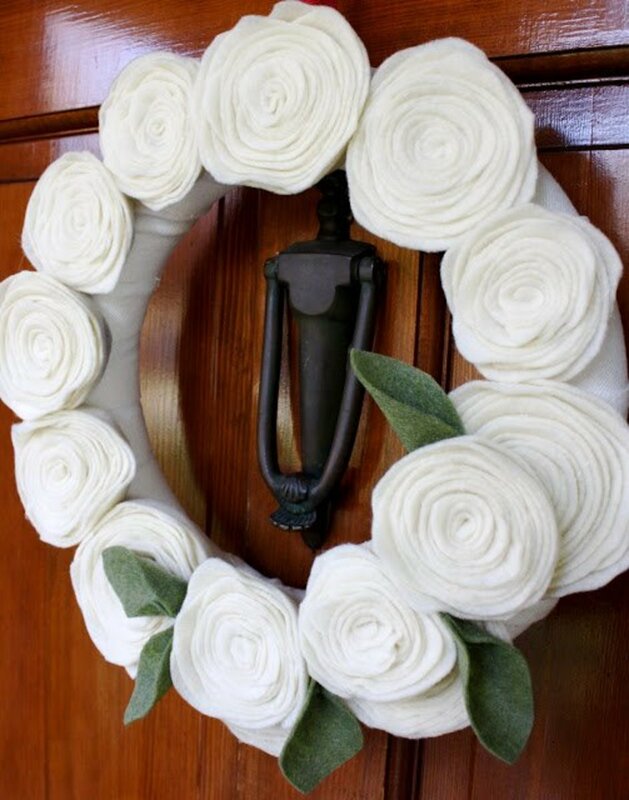 This tutorial by Gina from The Shabby Creek Cottage shows how to make the really full rolled roses. She uses a scalloped top edge to get the effect. Image of this rose at right. 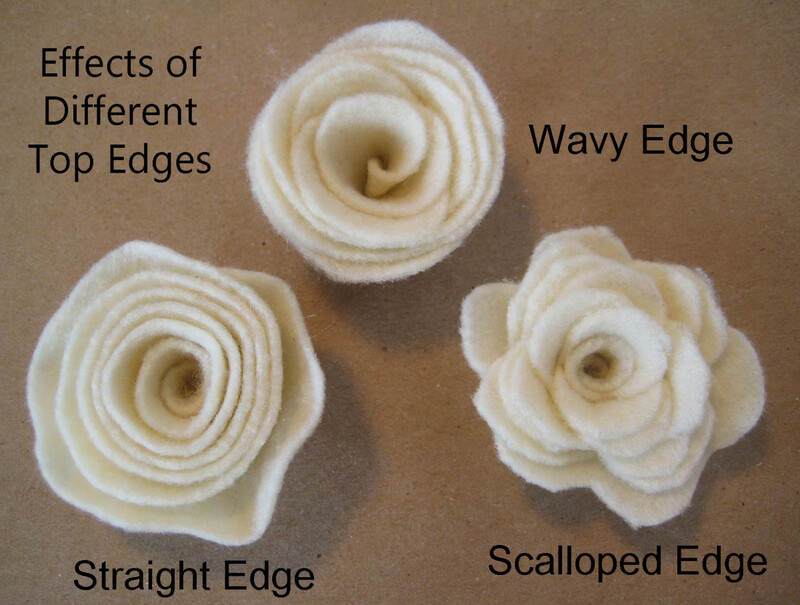 Here is an example of each cut in small felt rosettes. The circle that each was cut from was about the size of a CD. Delightful daisy rolled flower pattern and tutorial by Joy Kelley at How Joyful. This one includes some sewing. I think they're lovely. Her Photo to Right. 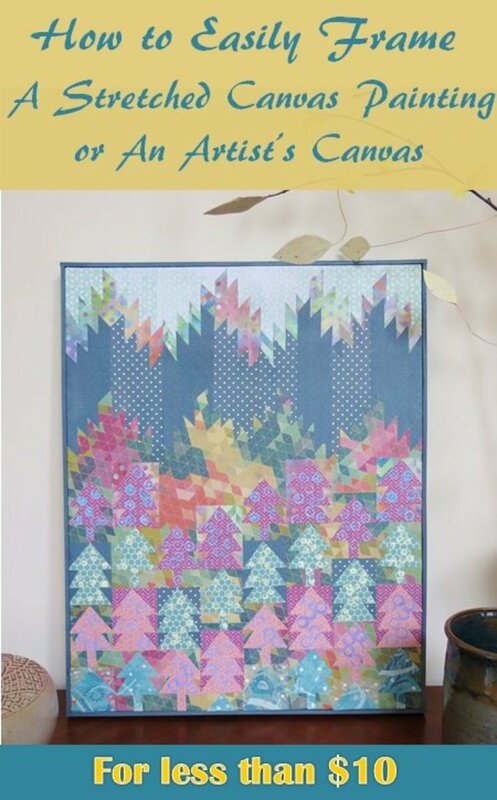 This is a lovely tutorial by Becky at Infarrantly Creative. It shows you step by step how to make multi-petaled peony type flowers. The flower is no-sew, but she also includes cute leaves which are embellished with simple stitches. Example to right. This method involves cutting the individual petals and then putting them together. I think the effect is beautiful and it's not complicated. I used both sewing and my glue gun - both worked well for me (just a little messy with the glue) TIP - use a skewer or toothpick to press the bottom of the petal together when it's called for. The glue is HOT! 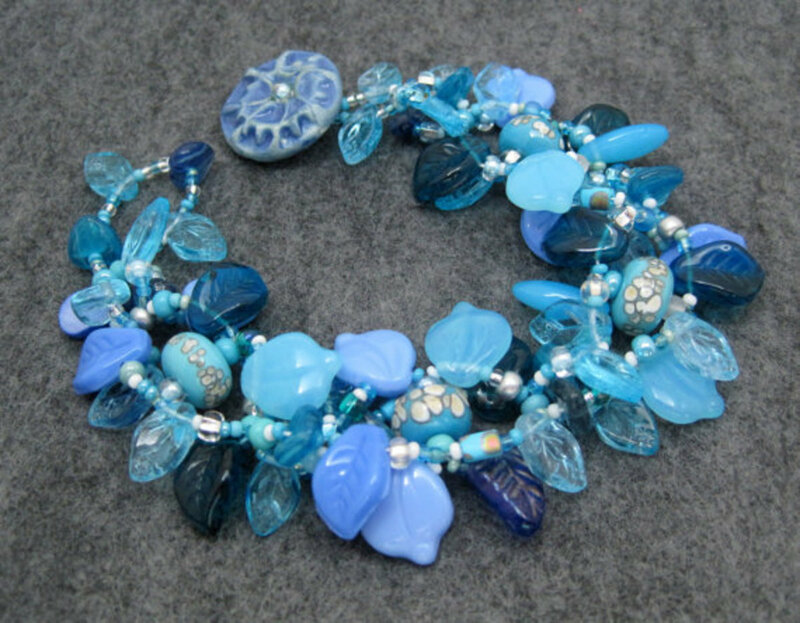 Very Sweet Flet Flowers made with individual petals by Jane Kohlenstein at her blog, Buzz Mills. Emily at One Lovely Life has written this great tutorial to make big beautiful felt mums (or dahlias). 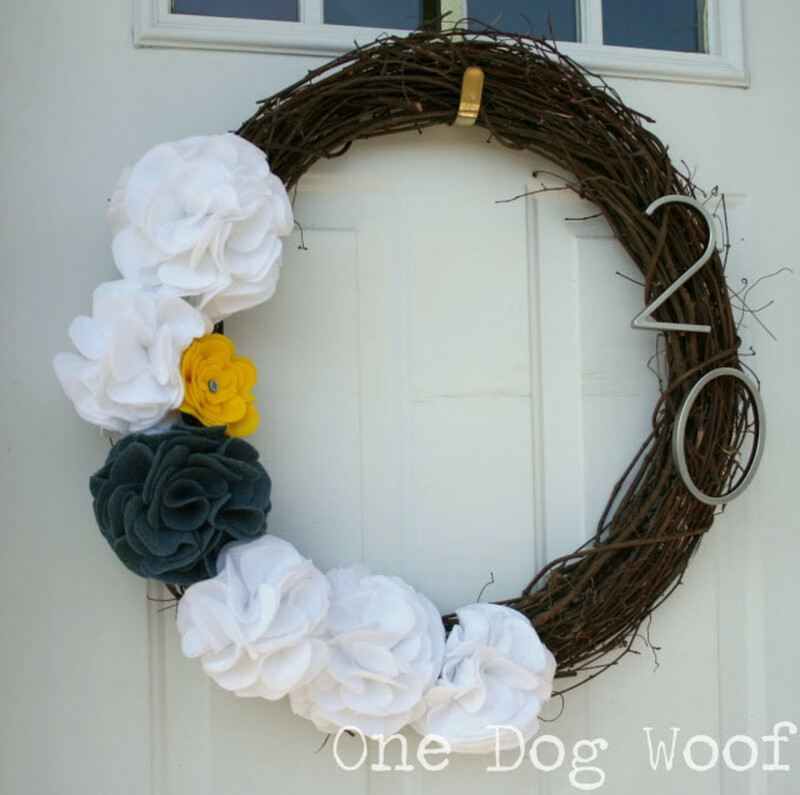 She also includes a fabulous wreath idea to put them on. This is a sewing tutorial, although I also made these with my glue gun. I love this video - the roses are very effective - beautiful and simple. She uses felt circles to create lovely roses. When cutting a stack of petals, hold the felt tightly as you cut - this keeps the size of the petals all the same. 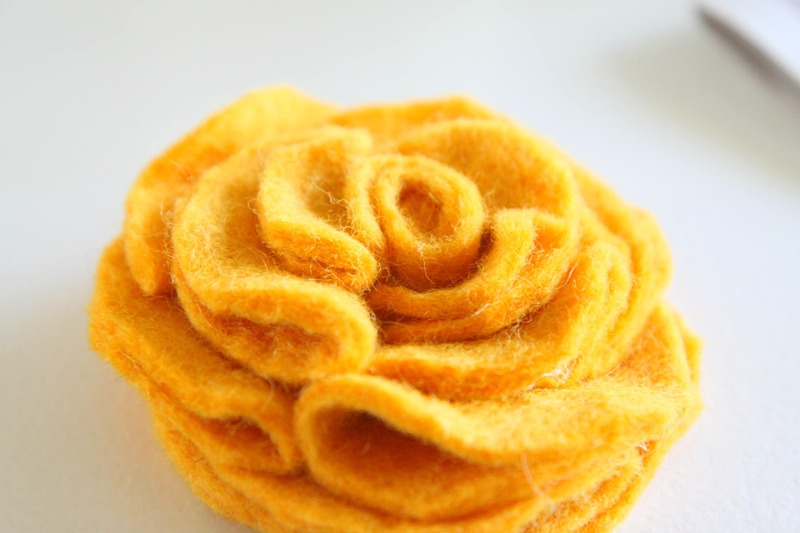 In this tutorial, Amy at Mom Advice shows how to make a simple and beautiful large rose broach. It's a no-sew project and quick and easy. Makes a fabulous gift! Using this method, shapes are cut and any number (from one to many) layers are stacked together and sewn (or glued) together. These can be tiny delicate blossoms, like the baby hair accessories below, or large, exuberant blooms. If you enjoy embroidery, this technique works very well for embellishing with some stitches. 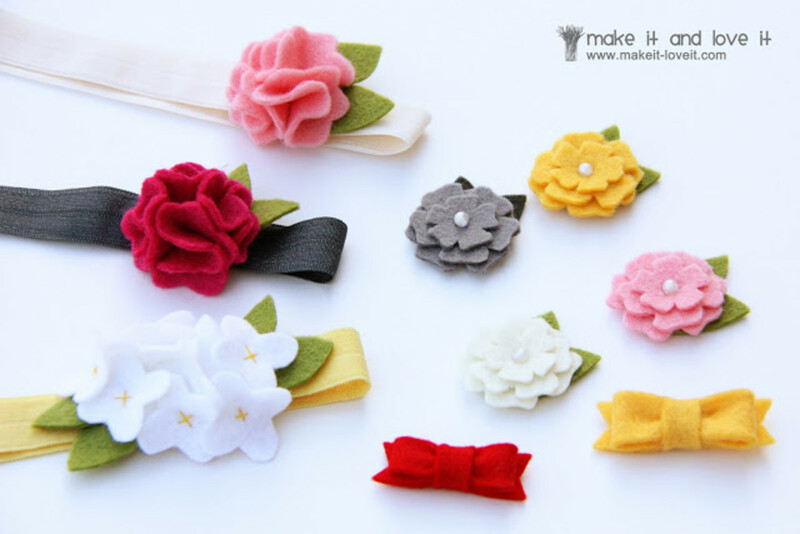 Ashley at Make it & Love it has created this great tutorial showing you how to make 3 different very pretty felt flowers - she uses them as baby hair accessories. She shows two simple and beautiful flowers made with the flat and stacked method. 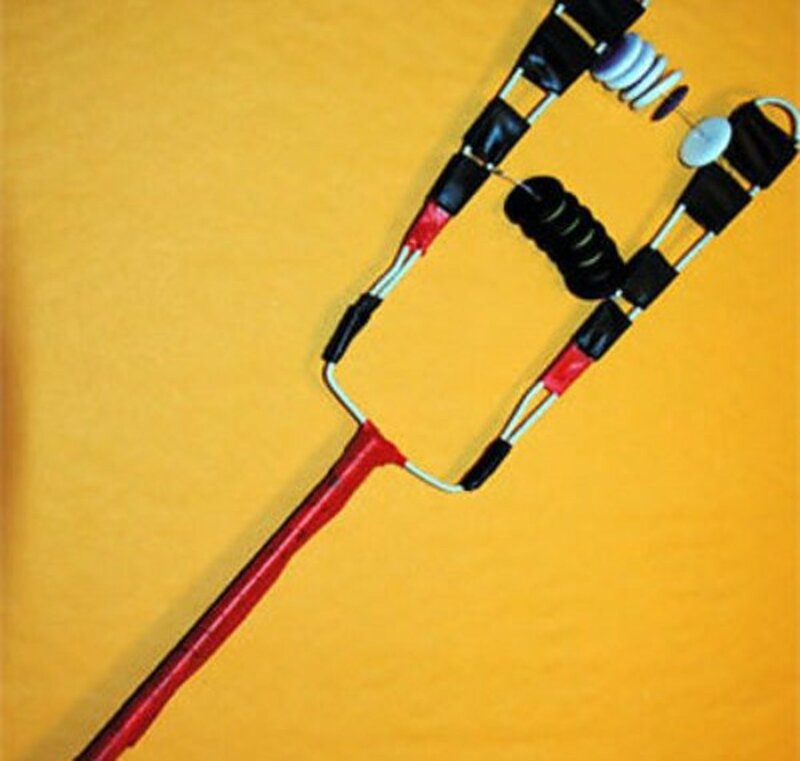 This craft is simple - only a few supplies are needed. What are the Different Types of Felt? There are four basic types of felt for this type of project - wool, wool blend, acrylic and "eco" felt. Wool felt is 100% wool. It's the most luxurious and rich to the touch and in appearance of the felts. It is possible to make your own wool felt material for these projects. You can upcycle wool garments or felt a knitted or crocheted piece (you need to felt them in a washing machine - see how here). They will be thicker than the felt you buy ready made, though so experiment to see if it works for your project. 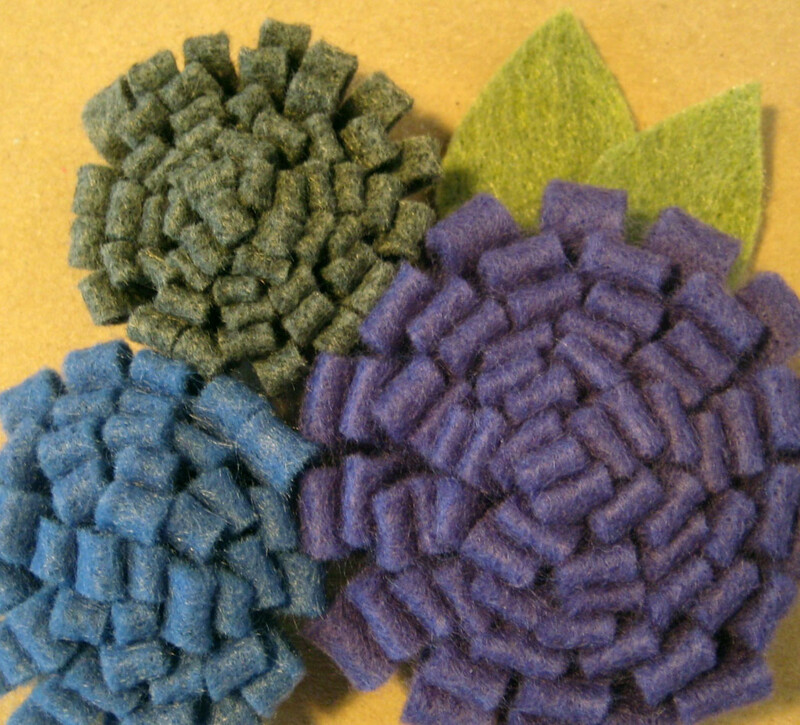 If you are familiar with felting unspun wool, you can make your own wool felt to cut up for these flower crafts, but I have to say that people who can do this technique probably will (and do) create unique and truly beautiful "artful" flowers - they are freed from the felt squares required for these more simple projects. But they could always use their scraps for a few easy felt flowers. What is Wool Blend Felt? Wool is also the most expensive felt to use, and an alternative is a wool blend. 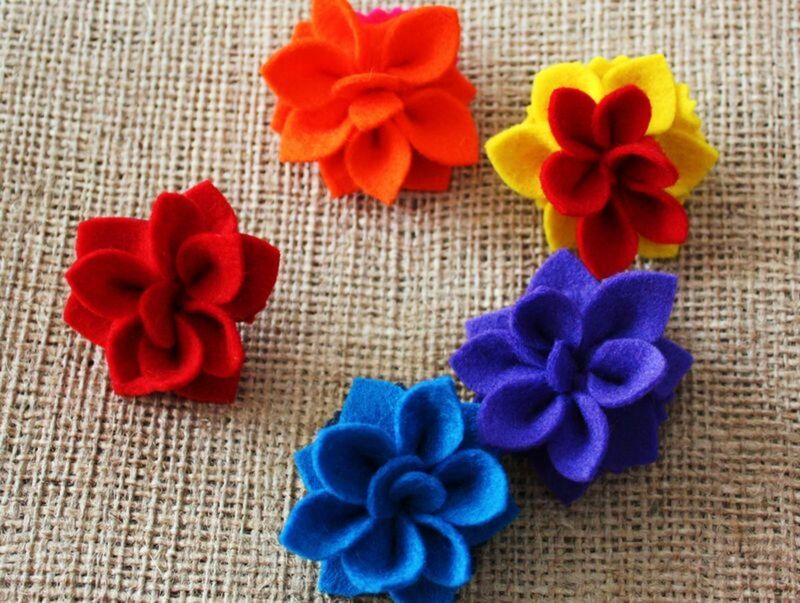 For these flower craft projects, we are talking about felt that is available in squares or by the yard. A wool blend is usually less expensive and still quite luxurious. According to my research, wool blends are often made from a blend of wool and rayon, made from plant fibre. They will most likely also be a little thicker than the acrylic felt, so again, it depends on the final look you want for your flower and your chosen scale or size of the finished piece. I have found that wool and wool blend felts tend to come in much more interesting and richer colours than acrylic. What is Acrylic Felt and Eco-Felt? Acrylic and eco-felts are made from plastic. Yup, plastic. The difference between the two being that eco felt is made from recycled plastic (bottles, for example). 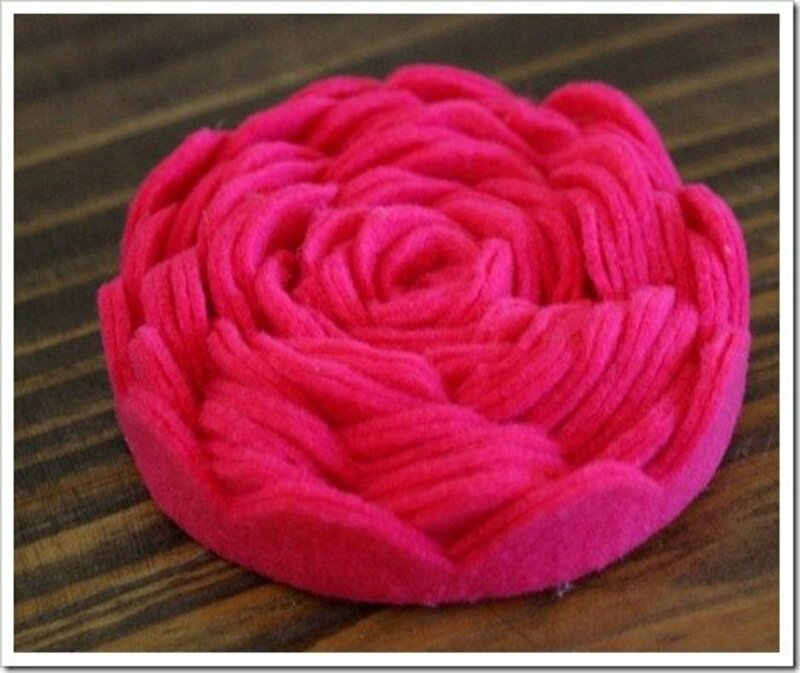 As a felt material for flowers, though, they are less expensive (eco-felts more expensive, though, and less available at chain type stores) and give great results. I recommend these felts for practice and for projects requiring low cost and large quantity. Also, they can fill the "must try now" urge we get to craft something we see. Thank you for these tutorials. I will so enjoy working with them. Thank you so very much for these tutorials. They will be a huge help when I make my daughter a felt bouquet for her wedding. Thanks also for information about the difference in felt types. You are very informative and a huge help. I'm not familiar with the shops there. Amazon is a great resource if you're stuck! 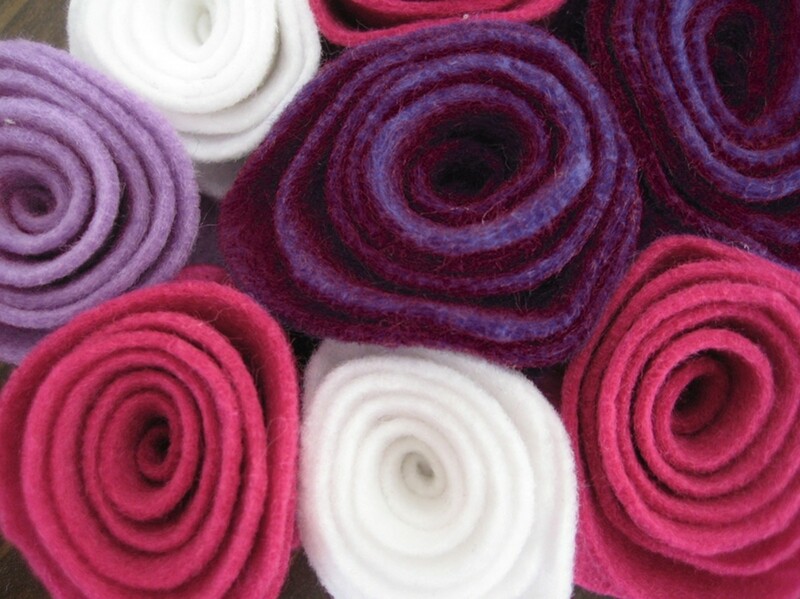 where do you buy your felt fabrics in jeddah? Hi peachpurple. They are definitely more sturdy. Thanks for visiting. Thank you, poetryman6969, thanks for visiting. I'm always making things. Aren't you the craft one! Gorgeous work. omg, this is such a great lens, thank you soooooo much, going to try everything that time allows! @gamesngames: I'm glad you enjoyed it! I love creativity. Beautiful lens. @Gayle Dowell: I hope your girls enjoy them! Thank you for the blessing! Great craft idea. My girls would love making these. Blessed! I should tell this to my sister! Very informative lens. Well done! 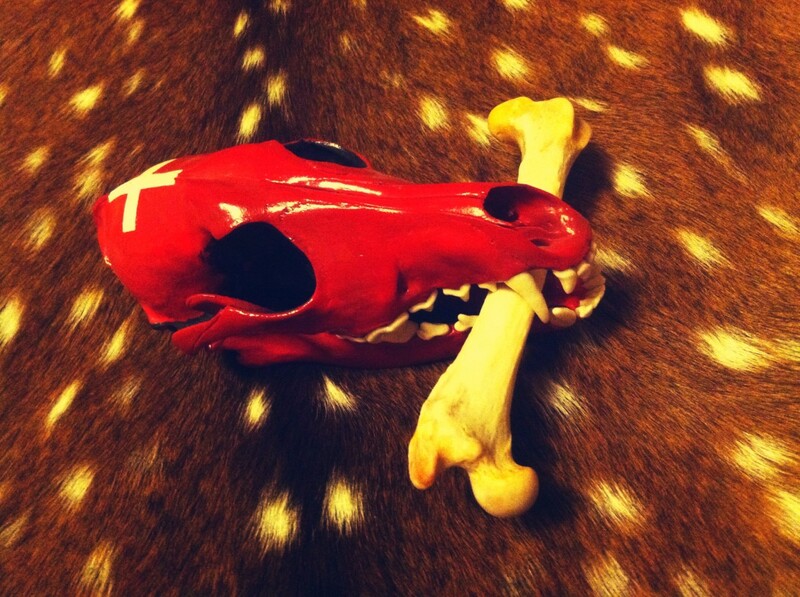 I love working with wool felt, must make some soon. What a fun project. I want to try this with my daughter. That video makes the roses look so easy! Thank you.